Our hip joint is a ball-in-socket joint. The femur, or thigh bone, has a top shaped like a ball called the femoral head. Our pelvis bone has a cup-shaped socket that holds the femoral head in place and allows it to rotate during movement. The cup-shaped socket, the acetabulum, and the femoral head form the hip joint. Bands of strong tissues called ligaments connect the femoral head to the acetabulum and provide stability. The surfaces of the bones in our hip joint are covered with articular cartilage. This is a strong smooth cover that cushions the ends of our bones and allows them to move easily. The remaining surfaces of our hip joint are covered with synovial membrane. This smooth thin tissue secretes synovial fluid that lubricates the joint and eliminates friction between the bones. The hip is one of our body’s largest weight-bearing joints. The primary function of the hip joint is to support the weight of our head, trunk, and arms. The hip joint provides a base of support that allows us to hold our body upright when we sit or stand. Likewise, it provides stability for our upper body while positioning the lower body for movement. The hip joint allows our legs to move to the front and back and from side to side as we walk, run, and climb stairs. It also allows our legs to rotate inward and outward. We rotate our legs when we place our feet on the ground. We angle our toes inward or outward for balance. Arthritis is a major cause of joint pain, stiffness, and swelling in the hip. Arthritis can occur for many reasons, including aging, “wear and tear,” injury, disease, and developmental abnormalities of the hip structure. There are over 100 different types of arthritis. Osteoarthritis, Post-Traumatic Arthritis, and Rheumatoid Arthritis are types of arthritis that most frequently develop in the hip. Osteoarthritis is the most common type of arthritis which typically develops as people grow older. Osteoarthritis can result from overuse of the hip during sports or work. Post-Traumatic Arthritis can develop in individuals of all ages after a hip injury, such as a fracture of the hip socket. Osteoarthritis causes the articular cartilage covering the end of the bones to gradually wear away, resulting in painful bone on bone rubbing. Abnormal bone growths, cysts or spurs, can grow in the hip joint. They add to the pain and swelling, while disrupting movement. Traumatic Arthritis can develop after a severe hip injury. A hip fracture can cause a condition called Avascular Necrosis. This medical condition causes a lack of blood flow to the femoral head and leads to bone and tissue death. Avascular Necrosis can cause articular cartilage damage, resulting in hip pain and stiffness. 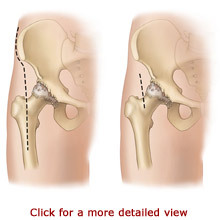 The main symptom of severe hip arthritis is dull and aching pain. You may feel pain in your hip, groin, thigh, buttock, and sometimes in the knee. The pain may occur while you are moving or resting. It may even keep you awake at night. Your hip may feel stiff. You may have difficulty moving or lifting your leg. Your hip pain may eventually limit your everyday activities, including walking, stair climbing, and bending. Medications and physical therapy may provide relief from the pain of severe hip arthritis. Your doctor can diagnose arthritis by conducting a physical examination. You will be asked about your medical history, symptoms, and level of pain. You may be asked to perform simple hip and leg movements to help your doctor assess your muscle strength, joint motion, and hip alignment. Blood tests and other laboratory tests may identify what type of arthritis you have. Your doctor will order X-rays to see the condition of your bones and to identify areas of arthritis, bone cysts, or bone spurs. Sometimes the tissues that surround the hip joint or the condition of the bones do not show up on an X-ray. In this case, your doctor may order Magnetic Resonance Imaging (MRI) scans or a bone scan. A MRI is used to obtain more detailed images. A bone scan identifies the location of abnormal growths in a bone, such as arthritis. A bone scan requires that you receive a small harmless injection of a radioactive substance several hours before your test. The substance collects in your bones in areas where the bone is breaking down or repairing itself. X-rays, MRIs, and bone scans are painless tests. However, they require that you remain very still while a camera takes pictures. As your arthritis progresses and becomes more severe, medication, rest, and physical therapy may fail to relieve your symptoms. Your pain and immobility may cause you to limit your activities and lifestyle. Hip Arthroplasty is recommended when non-surgical treatments do not provide relief of your symptoms. 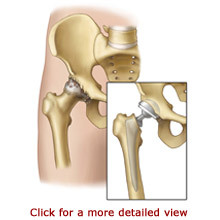 Hip Arthroplasty involves removing your damaged joint and replacing it with an artificial one. This is an inpatient procedure. You will most likely be admitted to the hospital on the day of your Arthroplasty and stay there for a few days. The most common types of anesthesia for the surgery are general anesthesia or spinal anesthesia. The general anesthesia will put you to sleep. The spinal anesthesia will numb your body from the waist down, while you remain awake, but sedated, so your memory is blurred. Your doctor will help you decide which anesthesia is best for you. You may also be required to donate your own blood for transfusion during the surgery. This is usually done several weeks before your operation. Your surgeon will make an incision on the side of your hip to access your joint. 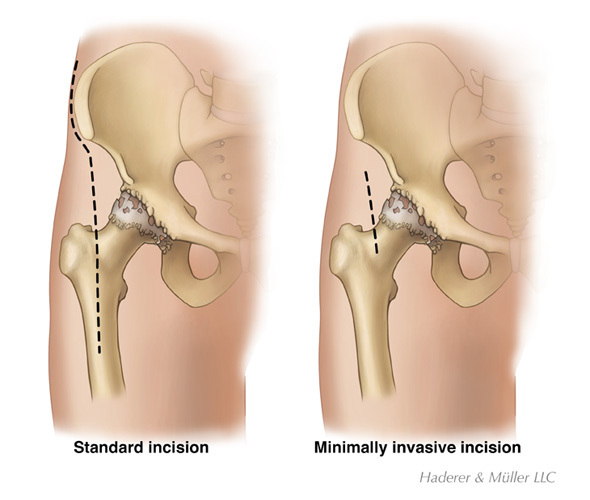 Your hip joint will be opened to allow your surgeon to remove damaged bone, cartilage, or connective tissue. The femoral head and the cartilage or bone from the hip socket will be removed. 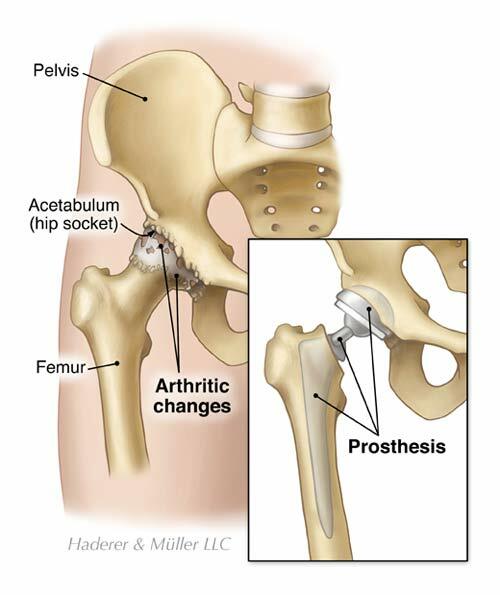 Your hip joint will be replaced with an artificial joint. There are a variety of artificial joint types, and your surgeon will choose the most appropriate one for you. A highly polished strong metal ball will be implanted or attached to the top of your femur. A durable socket made of plastic or plastic and metal will be attached to your bone with or without surgical screws or surgical cement. The artificial joint will allow you to perform most of the pain-free movements that you used to be able to do. You will stay in the hospital for two to five days following your Hip Arthroplasty and you will receive pain medication to make you as comfortable as possible. A V-shaped pillow may be placed between your legs to position your hip while it heals. You should sleep with a pillow between your legs for about six weeks. Your physician will temporarily restrict certain movements to prevent your artificial joint from dislocating. You should refrain from crossing your legs, bending your hips at more than a 90-degree angle, and pointing your feet inward or outwards depending on the surgical approach to your hip. Physical therapy and/or occupational therapy will begin the day after your surgery. You will need to use a walker, cane, or crutches while standing and walking. Your physical therapist will help you with walking and show you how to go up and down stairs. You will also learn ways to exercise to strengthen your hip. An occupational therapist can show you ways to dress and bathe within the realm of your movement restrictions. Your therapists can also recommend durable medical equipment for your home, such as a raised toilet seat or a shower chair. The equipment may make it easier for you to take care of yourself as you heal and help to prevent further injury. The success of your surgery will depend, in part, on how well you follow your instructions during the first few weeks following surgery. You may need help from another person during the first few days at home. If you do not have family members or friends nearby, ask your doctor about possible alternative arrangements. In many cases, doctors recommend time in a rehabilitation center following the surgery. You should be able to resume light activities soon after your procedure. Total healing can take three to four months. Overall, the majority of people experience a dramatic reduction of hip pain and gain the ability to resume functional activities after Hip Arthroplasty. It is important that you adhere to your exercise program and safety precautions when you return home. You may resume many of your former activities following your Hip Arthroplasty. You may have to change the way you do some activities, such as bending, to protect your new hip. You will be advised to avoid high-impact sports, such as jogging, for the rest of your life. High-impact sports or weight gain can put stress on your artificial joint, causing it to become loose or wear faster. However, it is very important that you continue with your recommended exercise program. It is important to avoid falling. Your therapists can suggest ways to prevent falls in your home. This may simply mean removing throw rugs and making sure that your walking path is free of cords and clutter. You should also continue to use the durable medical equipment as advised.